Snow. Wind. Ice. And Fire! From breathtaking snow sculptures and fireworks displays to romantic candle-lit snow lantern paths, Japan’s winter festivals are unmissable. Heading from north to south, here’s a selection of our favorites for 2019. 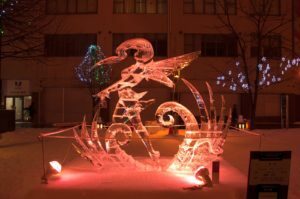 The Asahikawa Winter Festival (Asahikawa Fuyu Matsuri) is Hokkaido's second largest winter festival after Sapporo's Snow Festival. 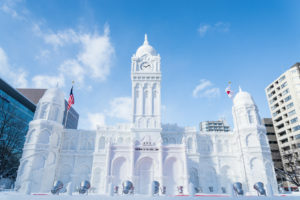 Famous for its record-breaking snow sculptures, Asahikawa builds one gigantic frozen structure every year as the centerpiece of its festival. This colossal construction doubles as a stage, and plays host to numerous live music acts and fireworks displays. 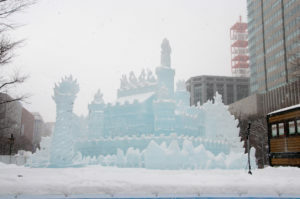 Meanwhile, in the city center, you can watch craftsmen at work creating ornate ice sculptures as part of an international competition. Once completed, these are beautifully illuminated at night. And if you’re feeling energetic, have a go on the ice slide, ride a snowmobile, or build a snowman before retiring to the ice bar! Otaru is so quaint, that words nor a photo can do it justice! 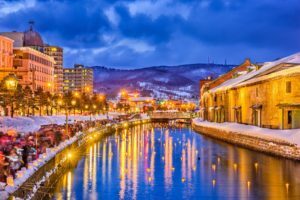 The charming and scenic town of Otaru in Hokkaido hosts an equally charming and scenic annual snow festival. Hundreds of tiny lanterns float in the canal and line its edges, their soft glow reflecting in the water and creating a wonderfully cozy and romantic atmosphere. Small illuminated snow statues are also built alongside the town’s abandoned train track, where you can enjoy a peaceful stroll through a scene that’s jumped straight out of a fairytale. The main festival areas are lit up from 5-9 p.m.
Sapporo Snow Festival needs no introduction. 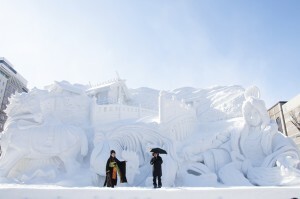 It’s the most popular in Japan, and its larger-than-life snow sculptures – often themed around pop culture favorites such as Final Fantasy and Star Wars – are world-renowned. Awe-inspiring and gravity-defying, they look even more spectacular after dark when illuminated. You’ll also find endless food stalls, live music performances and a snowy play area for kids. The festival’s city-center location in Hokkaido’s main city of Sapporo also means it’s one of the most convenient to visit. The main sites are open 24 hours, with the illuminations lit from dusk until 10 or 11 p.m. The Tsudome is open from 9 a.m.-5 p.m.
Lake Shikotsu is famous for having some of the clearest water in Japan, and it’s put to good use during this festival! 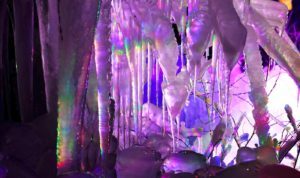 Stunning ice sculptures are created from the lake’s water, and illuminated after dark to create a fairytale kingdom. 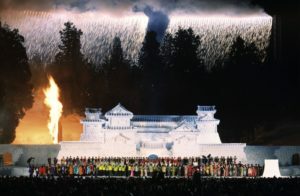 Other highlights include fireworks shows, taiko drumming performances, ice skating, and even “ice weddings,” where you can pledge your eternal love for your significant other! 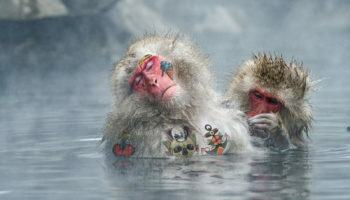 The area’s numerous onsen also provide the perfect way to warm up after a night of ice appreciation. Buses run from Sapporo city and Chitose station directly to the venue. Hirosaki Snow Lantern Festival at the amazing Hirosaki Castle. Picture the scene: a traditional, three-story Japanese castle stands elegantly in the middle of a park. 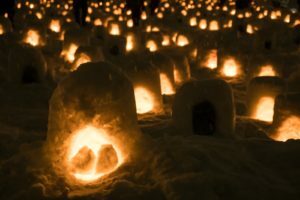 Around 200 hand-crafted snow lanterns are scattered across the grounds, softly illuminating the area. Nearby, an avenue of winter-blooming cherry blossoms is lit up in delicate pink. 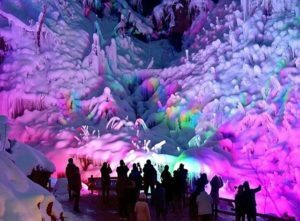 Add in fireworks, projection mapping displays and snow sculptures, and it’s easy to see why Hirosaki Castle’s Snow Lantern Festival is one of the most picturesque around! 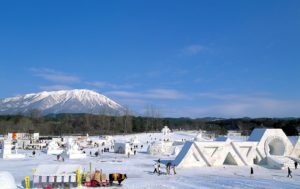 Thanks to its location on spacious farmland and ski resorts near Mount Iwate, this festival can offer visitors all manner of snow-related activities. These include sledding, snowshoeing and snow tubing, as well as a giant snow slide – perfect for the young and young at heart! 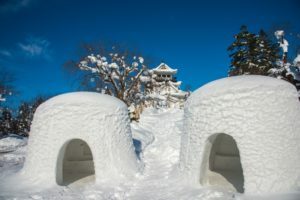 You can also admire snow sculptures, marvel at fireworks displays, and sample plenty of local cuisine before hitting one of the nearby onsen for ultimate relaxation. This festival dates back over 400 years and sees the city of Yokote in Akita Prefecture transformed into a forest of kamakura. These igloo-like structures are hollowed-out snow domes, ranging in size from those just large enough to hold a candle to ones that can host small groups of guests. If invited in, you can pray to a water deity at the small altar before enjoying rice wine and daifuku rice cakes. And don’t miss the stream of tiny illuminated kamakura next to the river – it’s a truly magical sight. 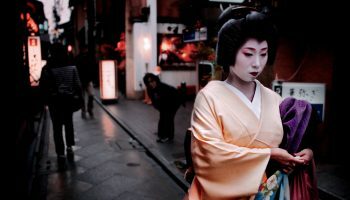 The kamakura are open from 6-9 p.m. Other attractions are also available during the day. 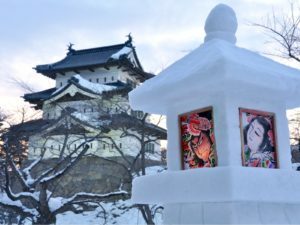 As one of the snowiest towns in the country, it’s no surprise that Niigata’s Tokamachi is the home of Japan’s original snow festival. Bursting with community spirit and down-to-earth charm, it features snow sculptures dotted all around the area that are created by both professional artists and local residents. 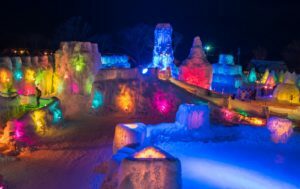 The event’s highlight is the Snow Carnival on Saturday evening, which features live music, light shows, and fireworks – all on a giant stage made entirely out of snow! Ashigakubo creates an icy wonderland by spraying water over the trees and hillside, where it freezes into a wild array of delicate and peculiar shapes. On weekends and holidays this intricate scenery is colorfully illuminated after dusk to create an extra-magical effect! 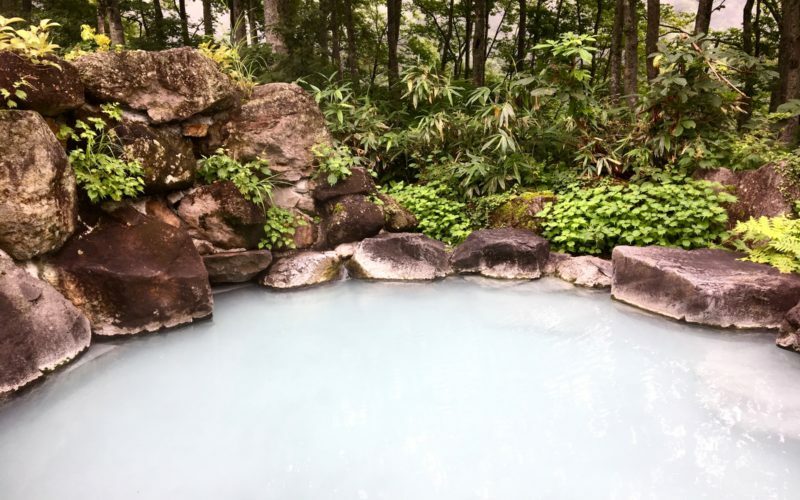 The festival is an easy day trip from Tokyo, and the nominal entrance fee includes a free drink of either hot tea or amazake (sweet, low-alcohol rice wine) to keep the chills at bay. 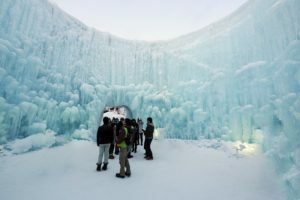 9 a.m.-4 p.m., plus illuminations on Fridays, Saturdays, Sundays and holidays from dusk until 8 p.m.
Lake Saiko has wicked ice formations and Mount Fuji! 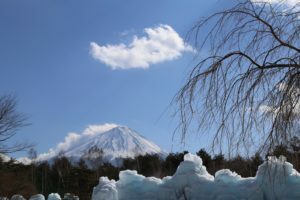 If you’re looking for an ice festival with an epic backdrop, you can’t get more iconic than Mount Fuji! 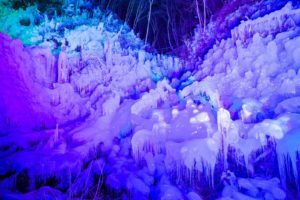 At Lake Saiko’s annual ice festival you can marvel at ice sculptures and 10-meter-high frost-covered trees known as juhyou, both of which are illuminated after nightfall. For extra sparkle, you can also enjoy the nearby winter fireworks show at Lake Kawaguchiko if you visit on a weekend. Kawaguchiko station. Then take the bus to Saiko Yacho-no-mori Park. These blossoms are not confused. They’re perfect.